PowerPak is a real game-changer. It’s the perfect solution to give your power hitters instant and residual energy to quickly return to peak production. And that’s a home run for the health of your herd… and your profitability. 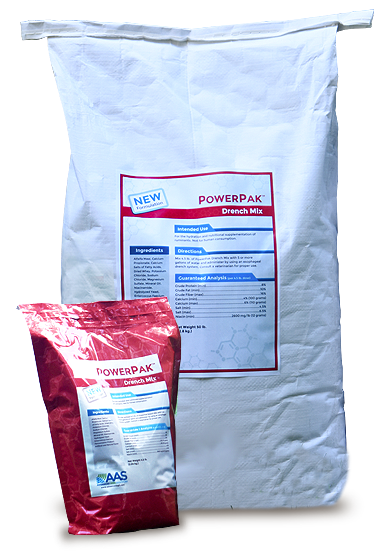 Next, read about the complete list of essential nutrients provided in every premixed PowerPak dose. See our simple, step-by-step video on proper drench technique, demonstrated by Dr. Joe Bender. Calves need added nutrition and protection against disease to ensure healthy growth. 1. Currin J. Fluid therapy for sick cows: To pump or not to pump. Virginia Tech. Dairy Pipeline. October 2007. Available at: http://www.sites.ext.vt.edu/newsletter-archive/dairy/2007-10/FluidTherapy.html. Accessed: 7/19/17. 2. Hutjens M. Drenching fresh cows. University of Illinois. Illinois Livestock Trail, April 2002. Available at: http://livestocktrail.illinois.edu/dairynet/paperDisplay.cfm?ContentID=636. Accessed: 7/6/17. 3. Puch H. Rumen bugs 101—feeding the microbes, not just the cow. Progressive Cattleman. December 2016. Available at: http://www.progressivecattle.com/topics/feed-nutrition/7611-rumen-bugs-101-feeding-the-microbes-not-just-the-cow. Accessed: 7/10/17. 4. Newell R. Alfalfa still reigns in dairy diets, but watch for surplus RDP. Progressive Dairyman. February 2015. Available at: http://www.progressivedairy.com/topics/feed-nutrition/alfalfa-still-reigns-in-dairy-diets-but-watch-for-surplus-rdp. Accessed: 7/10/17. 5. Hilyses Data Sheet. Available at: http://www.hilyses.com/wp-content/uploads/2016/11/20161107-Hilyses-Data-Sheet.pdf. Accessed: 8/11/17.